Taal, Batangas is known for its Spanish-era ancestral houses and is even acknowledged as a National Historical Landmark of the Philippines. If you visit Taal, you will notice the abundance of businesses focused on making Barong Tagalogs and Balisongs. As such the third class municipality has been known as the Balisong and Barong Tagalog Capital of the Philippines. This church is really old and attests to the strong Catholic faith of the majority of Filipinos. Built around 1700, Bagumbayan Church was meant to accommodate the expanding number of Catholics in Taal. No, it’s not a Church for knives. Balisong Church was blessed in 1781 and is one of the four churches built around the basilica. Another evidence that during the Spanish-era Catholic faith is rapidly growing and there is a need for churches to accommodate all Catholics. 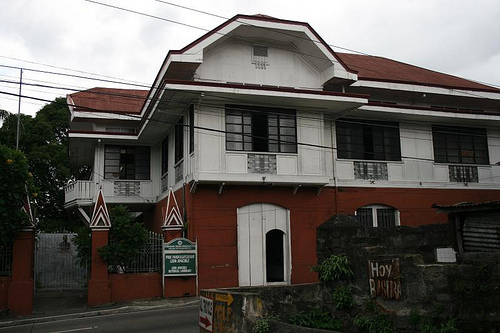 The Don Leon Apacible Museum was once the ancestral home of Don Leon and his wife, Matilde Apacible. The American-inspired house is located on the main street of Taal. Don Leon was the country’s first president’s Finance officer and also a delegate to the Malolos Congress (1898). The carefully-preserved museum is filled with ancient items, and if you’re a history fan you’ll definitely enjoy the trip! Some of the displayed items are Ming Dynasty potteries with their blue and white designs and motifs, 18th-century chandeliers from Germany, and hand-painted Venetian dinner service. The tour guides are very accommodating too. The Well of Sta. Lucia was actually a spring where two women are said to have seen the reflection of the Virgin of Caysasay. Because of the miraculous incident, a well was built around it in 1600 and since then many claimed that the Well of Sta. Lucia has healing powers. What’s noticeable about the well is that the carving technique on its walls is pretty old, and this technique has been used in other civilizations like Ankor Wat in Cambodia. You should observe the carvings when you go visit this place because it is a piece of art unto itself. Taal has a lot of great places to offer. Pretty much like Ilocos, this heritage province will take you several centuries back.